A few pious women known as the Institute of the Handmaids of the Holy Eucharist were leading a quiet, hidden life of prayer in Yuzawadai just outside of Akita when they welcomed into their novitiate Sister Agnes Katsuko Sasagawa, who was then 42 years old and a convert from Buddhism. When she entered on May 12, 1973, Agnes was totally and incurably deaf, however she was blessed with various mystical favors; soon this convent would become so well known that their little chapel would attract pilgrims from around the world. The first miraculous event at Akita occurred on June 12, 1973, only a month after the entrance of Sr. Agnes:A brilliant light shone forth from the Tabernacle. This happened several times and was often accompanied by something resembling smoke which hung around the altar. During one of these illuminations Sr. Agnes saw ". . . a multitude of beings similar to Angels who surrounded the altar in adoration before the Host." Bishop Ito was staying at the convent to conduct a week of devotions. Sr. Agnes confided to him the circumstances of this vision, as well as all the events and apparitions that followed. Bishop Ito and the convent's spiritual director, Rev. Teiji Yasuda, were witnesses to many of the events. Sr. Agnes was also favored with visitations of her guardian Angel. Asked to describe the Angel, Sr. Agnes replied: "a round face, an expression of sweetness . . . a person covered with a shining whiteness like snow . . ." The guardian Angel confided various messages to the sister and often prayed with her, in addition to guiding and advising her. On the evening of June 28, 1973, Sr. Agnes discovered on the palm of her left hand a cross-shaped wound that was exceedingly painful. On July 5, 1973, a small opening appeared in the center from which blood began to flow. Later, the pain would ease during most of the week except for Thursday nights and all day Friday, when the pain became almost unbearable. Then on July 6 the guardian Angel appeared, telling Sr. Agnes: ". . . The wounds of Mary are much deeper and more sorrowful than yours. Let us go to pray together in the chapel." After entering the chapel the Angel disappeared. Sr. Agnes then turned to the statue of Mary situated on the right side of the altar. 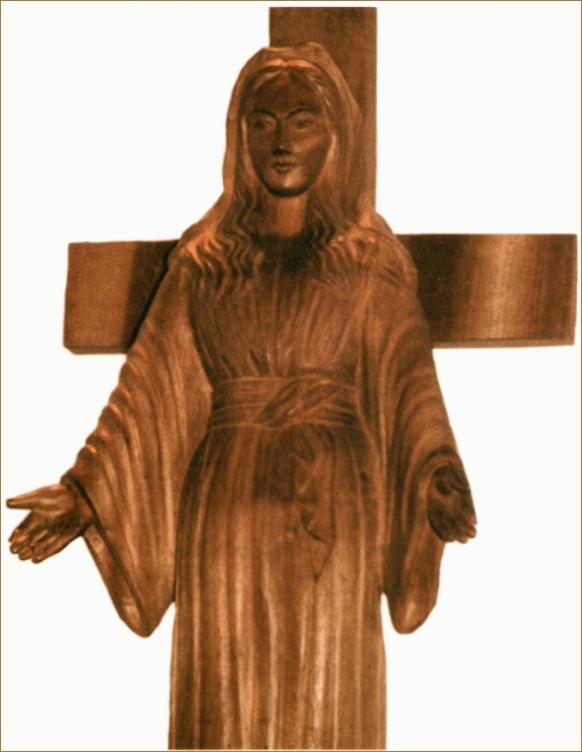 The statue, which is approximately three feet tall had been carved from the hard wood of the Judea tree: it is a figure of Our Lady standing before a cross, her arms at her side with the palms of her hands facing forward. Beneath her feet is a globe representing the world. When Sr. Agnes approached the statue, she said, "I suddenly felt that the wooden statue came to life and was about to speak to me . . . She was bathed in a brilliant light . . . and at the same moment a voice of indescribable beauty struck my totally deaf ears." Our Lady told her: ". . . Your deafness will be healed . . ." She then recited with Sr. Agnes the community prayer that had been composed by Bishop Ito. At the words "Jesus present in the Eucharist," Mary instructed, "From now on, you will add TRULY." Together with the Angel who again appeared, the three voices recited a consecration to the Most Sacred Heart of Jesus, TRULY present in the Holy Eucharist. Before disappearing, Our Lady asked that Sr. Agnes "pray very much for the Pope, bishops and priests . . ."
The next morning, when the sisters assembled for the recitation of Lauds, they found blood on the right hand of the statue and two lines which crossed, in the middle of which was an opening from which the blood flowed. The wound matched that on the hand of Sr. Agnes except that, since the statue's hand was smaller, its wound was smaller. It bled on the Fridays of July during the year 1973, as did the wound on the hand of Sr. Agnes. One of the sisters wrote: "It seemed to be truly cut into flesh. The edge of the cross had the aspect of human flesh and one even saw the grain of the skin like a fingerprint. I said to myself at that moment that the wound was real . . ."
Of special noteworthiness, the drops of blood ran the length of the statue's hand, which was open and pointing downward, yet the drops never fell from the hand. The wound on the hand of Sr. Agnes appeared on Thursday, June 28. As predicted by the guardian Angel, the wound disappeared on Friday, July 27 without leaving a trace. ". . . Many men in this world afflict the Lord . . . In order that the world might know His anger, the Heavenly Father is preparing to inflict a great chastisement on all mankind . . . I have prevented the coming of calamities by offering Him the sufferings of the Son on the Cross, His Precious Blood and beloved souls who console Him forming a cohort of victim souls. Prayer, penance and courageous sacrifices can soften the Father's anger . . . know that you must be fastened to the Cross with three nails. These three nails are poverty, chastity and obedience. Of the three, obedience is the foundation . . . When Sr. Agnes was professed, she pronounced these three vows. Although the wound on the hand of Sr. Agnes disappeared on July 27, the wound on the hand of the statue remained until its disappearance on September 29. At that time the statue emitted a bright light. The wound had remained for three months. While wounds in the hands of the statue bled, Bishop Ito advises that, contrary to some reports, ". ..the statue did not sweat blood or weep blood at any time." On the evening office of September 29, 1973, the whole community saw a brilliant light coming from the statue. Almost immediately the entire body of the statue became covered with a moisture resembling perspiration. Sr. Agnes' guardian Angel told her, "Mary is even sadder than when she shed blood. Dry the perspiration." The sisters used cotton balls to collect the moisture. Following Our Lady's message, the dazzling light that had surrounded the statue gradually disappeared. Toward the end of May, 1974, another phenomenon occurred. While the statue's garment and the hair retained the look of natural wood, the face, hands and feet became distinguished by a dark, reddish-brown tint. Eight years later, when the sculptor came to see the statue, he could not hide his surprise that only the visible parts of Our Lady's body had changed color, and that the face itself had changed expression. Then on January 4, 1975, to the amazement of the community and Fr. 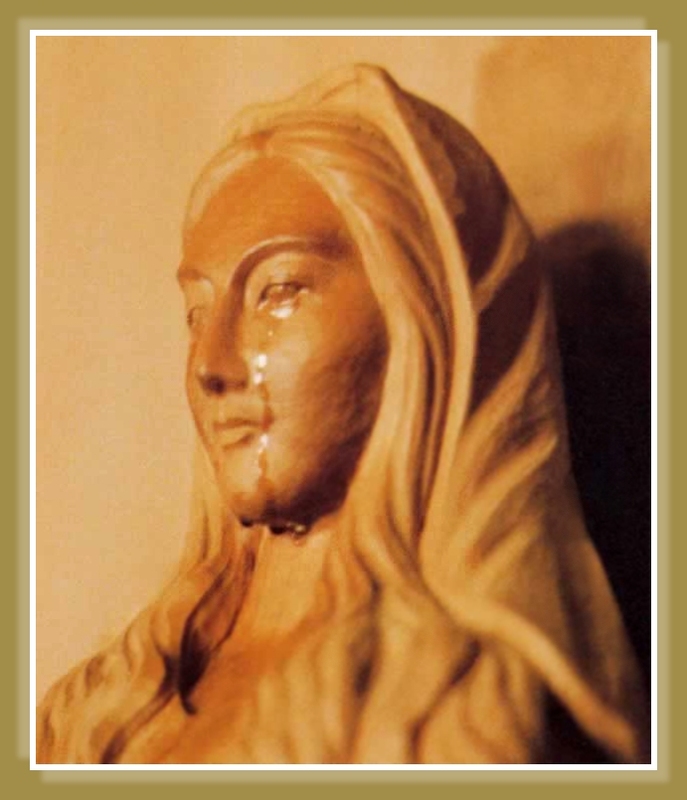 Yasuda, the statue of the Virgin began to weep and did so three times that day. Also witnessing these tears, in addition to the sisters, were Bishop Ito and a number of people who had joined the nuns for a New Year's retreat. In the 10 years following, scientific studies excluded any explanation other than the supernatural. the tears collected on the inside edge of the eyes flowed down the cheeks, collected at the edge of the garment near the throat, rolled down the folds of the garment and fell upon the globe under Our Lady's feet.
. . . had completely dried out during the years since it was made and little cracks had begun to appear. It is already miraculous if water would flow from such material, but it is still more prodigious that a liquid sightly salty, of the nature of true human tears, should have flowed precisely from the eyes." Eventually, Bishop Ito arranged for Professor Sagisaka, M.D., a non-Christian specialist in forensic medicine, to make a rigorous scientific examination of the three fluids, although the Bishop did not reveal their source. The results were: "The matter adhering on the gauze is human blood. The sweat and the tears absorbed in the two pieces of cotton are of human origin." The blood was found to belong to group B and the sweat and tears to group AB. Sr. Agnes belongs to group B.
Bishop Ito was advised by the Apostolic Nuncio to seek the assistance of the Archbishop of Tokyo in creating a commission of canonical inquiry. Unfortunately, the Inquisitor who was not Catholic was named president of this group. Without any of the members visiting the convent to conduct a personal inquiry, the commission rendered an unfavorable verdict. Unwilling to accept a negative verdict to the events he himself had witnessed, Bishop Ito asked the advice in Rome of the Congregation for the Doctrine of the Faith, as well as the Congregation for the Propagation of the Faith. He was then advised to form another commission to study the events from the beginning. This commission rendered a favorable verdict regarding the supernatural aspects of the events. The tears of December 8, 1979 were filmed by a televiion crew at 11 o'clock in the evening, the Feast of the Immaculate Conception, and was shown on television to 12 million people throughout Japan. It is now shown by the nuns at the convent and was shown during news broadcasts throughout the world. The statue of Mary was my first work connected with Christianity. Of my various statues, it is only with the statue of Mary at Yuzawadai that mysterious events occurred . . . I sculptured the whole statue of Mary, globe, and the Cross from the same piece of wood, so there are no joints . . . The wood from which I carved the statue of Mary was very dry and rather hard . . . When questioned as to whether he regards as a "miracle" the reported shedding of tears from the statue of Mary, he replied, "It is a mystery." "The object examined has adhering to it human liquids which belong to the blood group O." Since the first analysis revealed that the blood belonged to group B and the sweat and tears to group AB, it has been established that the fluids belong to three different blood groups. It is a medical fact that the blood, tears and sweat of an individual all belong to the same blood group. One fluid cannot differ in type from the other fluids of the same body. Since Sr. Agnes belonged to group B she could not have "ejected and transferred" blood or fluids belonging to group AB or O. The theory of the Inquisitor that Sr. Agnes exercised had ectoplasmic power wass thereby refuted. On the Feast of Our Lady of Sorrows [September 15], the statue cried for the last time. Two weeks later, Sr. Agnes' guardian Angel presented a large Bible surrounded with a brilliant light. The open Bible revealed the reference, Genesis 3:15. The Angel explained that the passage had a relationship with the tears of Mary and then continued.
. . . sin came into the world by a woman and it is also by a woman that salvation came to the world . . . The lachrymations number 101, and they took place at irregular intervals from January 4, 1975 until September 15, 1981. The first 1 is Eve, the second, Our Lady and the 0 represents the eternal Holy Trinity. According to the records kept by the sisters, the number of persons witnessing the tears went unrecorded on five occasions. However, all the other times they were witnessed by no fewer than ten persons, and other lachrymations were witnessed by various numbers of people, sometimes as many as 46, 55 and, for the last lachrymation, 65 people. Some of the witnesses were non-Christians and some were prominent Buddhists, including the mayor of the city. On October 13, the anniversary of the Miracle of the Sun at Fatima, 1973, Sr. Agnes heard the beautiful voice speaking from the statue once more: "The work of the devil will infiltrate even into the Church in such a way that one will see cardinals opposing cardinals, bishops against other bishops. The priests who venerate me will be scorned and opposed by their confreres, churches and altars will be sacked. The Church will be full of those who accept compromises and the devil will press many priests and consecrated souls to leave the service of the Lord. The demon would be especially implacable against souls consecrated to God. The thought of the loss of so many souls is the cause of my sadness. If sins increase in number and gravity, there will be no longer any pardon for them." She continued, "As I told you, if people do not repent and better themselves, the Father will inflict a terrible punishment on all humanity. It will be a punishment greater than the Flood, such as one will never have seen before. Fire will fall from the sky and will wipe out a great part of humanity, the good as well as the bad, sparing neither priests nor faithful. The survivors will find themselves so desolate that they will envy the dead. The only arms which will remain for you will be the Rosary and the Sign left by my Son. Each day recite the prayers of the Rosary. With the Rosary pray for the Pope, the bishops and the priests." The statue wept for the last time on September 15, Feast of Our Lady of Sorrows. A canonical law regarding the judgment of a Marian apparition was issued in 1978. According to a Vatican official: ". . . the authority to hand down a conclusion regarding the authenticity of any Marian apparition is given canonically to the ordinary (the bishop) of the local diocese where the apparition took place . . ."
In his pastoral letter dated April 22, 1984, Bishop John Ito, the Ordinary of the Diocese of Niigata, wrote that having been given directives in this regard, "I authorize throughout the entire diocese of which I am charged, the veneration of the Holy Mother of Akita." The Bishop noted that the events are only a matter of private revelation, and are not points of doctrine. The Bishop also mentioned in his pastoral letter that he had known Sr. Agnes Sasagawa for 10 years. "She is a woman sound in spirit, frank and without problems; she has always impressed me as a balanced person. Consequently the messages she says that she has received did not appear to me to be in any way the result of imagination or hallucination." Four years later, on June 20, 1988, during Bishop lto's visit to Rome, the Sacred Congregation for the Doctrine of the Faith approved the contents of the pastoral letter. Bishop Ito's official recognitions of the occurrences and the Madonna's messages were reported in the October, 1988 issue of the magazine 30 Days. In the August 1990 issue, Cardinal Ratzinger is quoted as saying that "there are no objections to the conclusion of the pastoral letter." Cardinal Ratzinger has invited the Bishop to continue to inform him about the pilgrimages and conversions.